The ARSENAL Assessment can help you manage stress, develop Stress Resilience and make better decisions. It is based on the ARSENAL Model (below) of seven best practices that are key to resisting the negative effects of stress. ARSENAL measures your overall level of stress as well as how well you are doing now in each of these seven areas. ARSENAL is your ally against stress. Stress causes heart disease, high blood pressure, weight problems, poor performance, depression and more. Since stress isn't going away completely—some stress is good—you need to be able to bounce back after periods of high stress. This easy-to-use tool is ideal for anyone who wants to improve their physical and mental performance and reduce stress. 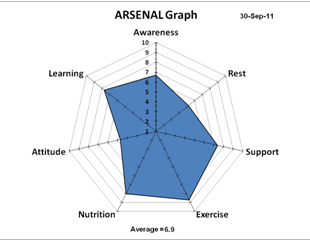 Professionals, coaches, trainers and consultants can use the ARSENAL Assessment with leaders, teams and individuals. Use ARSENAL to reduce stress, determine how well stress reduction efforts are working and to collect data that show performance and financial benefits. Take the ARSENAL Assessment online now for only $35. Then schedule a short call with an HPS feedback specialist to get your results. Your ARSENAL results include a personalized plan to help you become more Stress Resilient. View a sample report. ARSENAL is important for Leaders and Organizations. Leaders make decisions all day every day. Too much stress has a huge impact on a leader's ability to access Emotional Intelligence and cognitive ability (IQ), two essential components of decision making. When stress goes up, the ability to use them to make good decisions goes down. Poor decisions contribute to lost jobs and profit and to leader derailment. Use ARSENAL to stop the downward spiral that stress can cause in decision making. Leaders must be able to use their Emotional Intelligence and cognitive ability in tandem to make the best decisions. This sample shows that this person is strong in Exercise & Nutrition, good in Support & Learning and could benefit from improvement in Awareness, Rest & Attitude. The ARSENAL™ Assessment Report provides both visual and narrative feedback. See a sample report here. Part II contains an ARSENAL subscale graph, showing results for all seven best practices. Part III breaks the results down into the seven best practices. Part IV contains a development plan with step-by-step instructions to help increase Stress Resilience. Determine the effectiveness of their development plan and make changes in areas where little improvement has occurred. Establish a seasonal stress baseline by taking the ARSENAL every three months for a year. This points out whether particular times of the year are more stressful. You can plan for additional coaching or training to reinforce the seven best practices prior to these times. Become certified to use the ARSENAL Assessment with your clients or in your organization. Online certification is $295 and ARSENAL account set up and maintenance is Free. Call 706-769-5836 for more information or visit the ARSENAL Certification page. Does Your Company Need Help with Stress Management? We can help your leaders learn how to operate within an optimal range of stress, use tools to manage stress, and build Stress Resilience with their own personal ARSENAL™ of best practices.